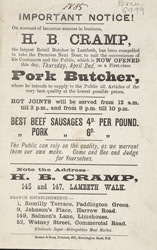 Pork Butchers in London in the 19th century were very enterprising, selling many different cuts of meat, they often claimed to use every part of the pig, ‘except its squeak’. Pig’s ears were sold as a snack, they would have been singed and then simmered with salt, carrot and onion. Another popular dish, sold by butchers was Pig’s fry, this was scrapes of pigs innards (heart, lung, liver or anything left over once the good meat had been taken) that was sliced, rolled in flour, seasoned and fried.